Changing your air filter should be a part of your seasonal home maintenance routine. It's essential for the life and efficiency of your HVAC system because a dirty air filter can block the airflow in your home and cause poor air quality. 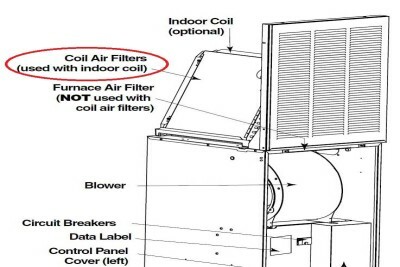 An air filter is used to protect the HVAC system from unwanted materials such as dust, pollen, dust mite or cockroach allergens, from building up on the fan motor, AC coils or any other surface. 1 This helps keep your HVAC system from clogging and cleans the air inside your home. Manufactured home builders suggest checking your air filter every 30-90 days according to your HVAC system manufacturer’s recommendation. Consider also that most furnaces are located in utility rooms where your washer and dryer are located, so dryer lint can quickly fill your air filter and mean you should check your air filter monthly. You may also check the product information on your air filter to see the air filter manufacturer’s recommendation. Whether you have a gas furnace or an electric furnace, start by looking for a metal return grill which will most likely be in your utility room. You can also locate your furnace by using your homeowner’s manual. If you have a gas furnace, the air filter will be located in the furnace door. You’ll find a blue or green mesh filter held in place by metal rods. This air filter material is called hog’s hair, and you can wash and reuse the material a couple times before replacing it. If you have an electric furnace, A-coils will be located behind the grill plate on top of the furnace, and your air filters will be on top of the A-coils. You will also see gray, wire mesh air filters resting on top of each side of the A-coil frame. A wire mesh air filter can be washed and reused a couple of times before you need to replace it. To clean the wire mesh air filter, vacuum the filter and wash it with warm water and a non- abrasive soap. We do recommend that you place paper, pleated air filters on top of your wire mesh air filters as seen below. However, only wire mesh air filters are required for your air filtration system to operate, and those are the only air filters that come with your manufactured home. Newer electric HVAC systems may have air filters placed apart from the A-coils. If this is the case, opening the grill plate will reveal your air filter resting in the grill rack. To figure out what size air filter you should buy if you’re replacing a paper pleated air filter, look at your existing manufactured home air filter size. It will be printed on the side of the filter. You can find both hog’s hair filters for gas furnaces and paper, pleated air filters for electric furnaces at your local hardware store. When looking to replace hog’s hair, you can ask for hog’s hair material cut to the size of your filter. When shopping for new wire mesh air filters for an electric furnace with A-coils, the best source is an online retailer such as an online manufactured home parts store. When buying your new air filter, it’s important to know that a less transparent filter means more debris and pollutants will be captured. Pet owners can look for air filters specifically made for pet hair and dandruff. Check your local hardware store for numerous air filter options. Changing your air filter every 30-90 days or as recommended by your HVAC system manufacturer is a great way to maintain your home for years to come. If you have a newer home with a fiberglass or paper, pleated air filter resting in your grill plate, you can watch a quick tutorial on how to change your air filter and follow the steps below. Buy a new filter. Check your Homeowner’s Manual to identify the right number or size. It should also be printed on the side of your existing air filter. Turn off the unit or the breaker. Insert the new filter by sliding it into place. Turn the unit or breaker back on. If you have a gas furnace with a hog’s hair air filter, follow the steps below to change your air filter. Open your grill plate to reveal the blue, gray or green hog’s hair to check for the correct size to buy. Close your grill plate again. Buy more hog’s hair material cut to the size of your current hog’s hair filter. Open your grill plate and pull out the dirty filter material. Insert the replacement filter material behind the grill plate. Put your metal grill plate back in place. Turn the system or breaker back on. If you have an electric furnace with wire mesh air filters, follow the steps below to change your air filter. You spend a lot of time inside your home, so you should do everything you can to keep the air you breathe clean and to help extend the life of your HVAC system. Regularly checking your air filter is a good place to start.